When you want to relax, there’s nothing better than climbing into the high-powered jets of a hot tub. Whether you want a luxury hot tub as part of your concrete pool build or an acrylic hot tub, you can depend on the experienced team at Elite Pools by Aloha to deliver! Many people interchange the word “spa” and the word “hot tub” although they mean different things. “Spas” are often made of acrylic or fiberglass whereas “hot tubs” may be made from wood and have a liner. While spas often have contoured seating, some hot tubs do not. “Hot tub spas” may be used as a general term for both when talking about a seated, water-filled tub that uses heat and jets to relax and massage. Luxury hot tubs are a great feature to add to your home! Research shows that regular use of warm water therapy can help your joints and circulation, as well as reduce pain. Hydromassage (the massaging pressure from the jets) helps with stress relief and relaxation. Many people add a hot tub to their home for the entertainment value, too! The whole family can participate in a distraction-free zone, helping you strengthen your bonds. Elite Pools by Aloha carries the full line of Jacuzzi brand hot tubs with a wide range of sizes, from two to three person occupancy up to over six person occupancy. Contoured loungers provide you with comfort and relaxation while over 50 adjustable jets for every area of your body – from back and legs to your feet and neck – provide you the level of massage you desire, from vigorous to gentle. Our custom hot tubs come with a built-in electric heater that stays above 100-104 degrees all winter long, giving you access to your spa year-round. Each Jacuzzi hot tub comes with a thermal cover to allow you to heat your well-insulated spa before you step foot in it. Your maintenance plan for a Jacuzzi hot tub is simple and easy to use. The disinfection package that comes with your hot tub ozonates the water, leaving no residue behind and keeping it fresh. You can set your spa to automatically run the maintenance systems with the LED panel located on your hot tub. Once you decide which Jacuzzi hot tub is right for you, we will order it and have it ship to your home in a matter of weeks. Following installation and instructions with our team on how to use your spa, you will be well on your way to a relaxing experience with your new hot tub! Most frequently built as part of a concrete pool (often called “gunite pool”) during construction, our concrete spas can be customized to your specifications. We can create any shape or size spa you can dream! Our spas offer 10 to 12 powerful jets and along with a bench to give you and your guests space to socialize and relax. 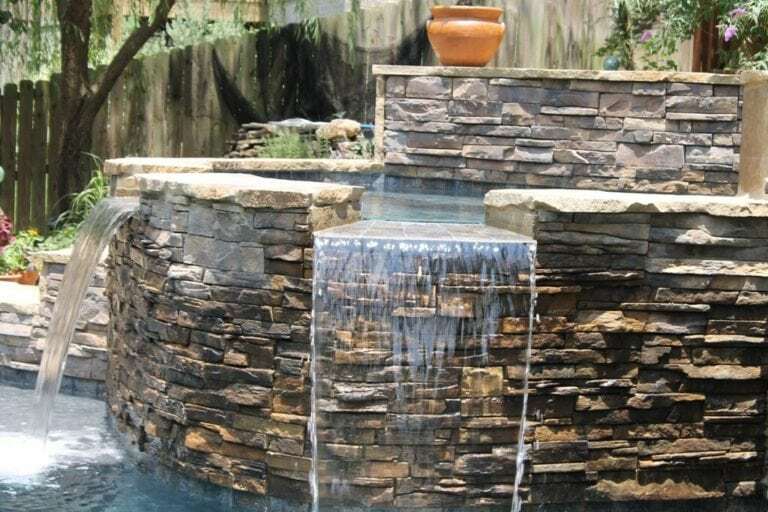 The concrete spa uses the same water and heater as your gunite pool, giving you a chance to heat them together and enjoy the same temperature throughout, something you can’t do with an acrylic spa. In addition to all of the features you expect in your concrete spa, you can use the remote control to heat it up whenever you want! The maintenance program for your spa is part of your concrete swimming pool maintenance package. Set the pool water to spill over into the spa to refresh the water, and you’re good to go! Our customers love how low maintenance a concrete spa is compared to other types of hot tubs. Additionally, our concrete spas contain a canister that collects leaves and debris for easy cleaning. You won’t have to worry about skimming the concrete spa – our easy debris collection system takes the guesswork out of cleaning! Our technicians go over many aspects of caring for your spa, such as cleaning filter pads, yearly and weekly maintenance, and how to use the remotes (which are simple with LED readout to control temperature and lights). We can go over how to clean the pool with skimmers, chemicals for the pool, and pool vacuums as well depending how much education you want or need. Our warranty plans come with unprecedented protection for your lights, motors, and electronics for both concrete and vinyl spas. No other competitor matches our warranties and we use only the highest quality materials. For our concrete spas, we offer an additional automation package for the remote and smartphone control setups which allow you to power on your spa at anytime and anywhere. For vinyl hot tubs, our automation package can be added on as an upgrade to your service. To learn about our full line of Jacuzzi spas and hot tubs, contact Elite Pools by Aloha for a free consultation!